Dragon Ball: Daimaou Fukkatsu (ドラゴンボール 大魔王復活, Dragon Ball: Daimaou Fukkatsu? trans. 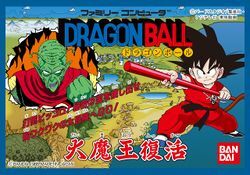 Dragon Ball: Great Demon King's Revival) is an adventure game developed by TOSE for the Famicom, and published by Bandai in 1988. It is a follow-up to Dragon Ball: Shenron no Nazo, although not necessarily a sequel. This game covers the first generation of Dragon Ball, where Goku is still a child and the Saiyans have not yet entered the picture. Daimaou Fukkatsu roughly means "Demon King's Revival" and refers to Piccolo, then still the chief antagonist. It takes place during the Piccolo Daimao Saga. It was one of the first games to have a board game, which included battles using cards. The battle card games are a hybrid of role playing games, board games and trading cards. The players move around a game board and encounter characters on the way. Some characters offer information and others need to be battled. The outcome of each fight is determined by the randomly generated hand of cards players and the opponent are dealt. The player flips over cards in a certain order, and their actions are shown in an animated battle that lasts until one of the characters is defeated. The game was never released outside of Japan. However, an extensive and high-quality fan-translation has been produced by the translation group Stardust Crusaders. It not only translates the text into English, but it also fully converts the Kanji glyphs on the card to more intuitive icons such as a fist or a kick, and the Japanese numbers into Roman numerals. This page was last edited on 16 April 2017, at 15:06.